While reading skills are an accepted key skill both for life and study, the capacity to read critically and apply reading concepts to solve problems and develop higher order conceptual understandings requires a high level of cognitive self-regulation that students do not always have. 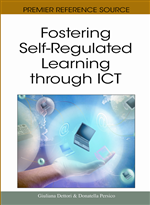 This chapter describes the development of and research into an environment, Mark-UP, designed to promote the self-monitoring inherent in regulating reading comprehension. The environment consists of a range of tools to assist learners in monitoring their comprehension through annotation, discussion, problem-solving and so on. The tool was applied to a class of undergraduate students in Interface and Information Design at an Australian university. The research involved questionnaires of the whole cohort as well as case studies of a number of student experiences with the environment, using interview and analysis of the students’ portfolios. The study found that, concerning students with weak academic skills, Mark-UP provided some support for their learning, but for stronger students it replicated cognitive strategies that they had already developed. The product was most effective for those students with moderate existing academic skills as it articulated and modeled strategies for reading that they could apply and go beyond to develop their own cognitive regulatory strategies for reading.